I love having indoor plants. For years I steered clear of them because my small kids and 2 cats made it impossible for me to keep them around. But my house suffered because of it for sure! Sometimes you want a special place for your plants to call home and for this reason, I just love this project that finds a wonderful way to use those frames from the Dollar Store. I absolutely ❤ that ! As soon as you move this,it will fall apart!You can not use hot glue for everything. I buy frames from Goodwill and Salvation Army…paint if you want all the same color. Cheaper than the $ store. When our granddaughter was younger, my husband bought 3 pieces of 2×2 precut plywood. He ripped 2 of them in two. And made a rectangular box 1×1 and 2 feet tall. He held them together with small metal straps. On one side he used hinges. He also used metal straps to anchor the bottom of the box in the center on the remaining piece of plywood to keep it from toppling over. We cut a pool noodle and glued around the top. We also placed a piece of wood in the bottom to keep her feet in place. She used this for quite some time. Good Luck. Worthless ad couldn’t get to it, wast of my time! You mean ” grilla” glue? Michelle Brougham Davis, check this out! Thank you, I couldn’t get it to open. And you used this for what ? Im lost here ? 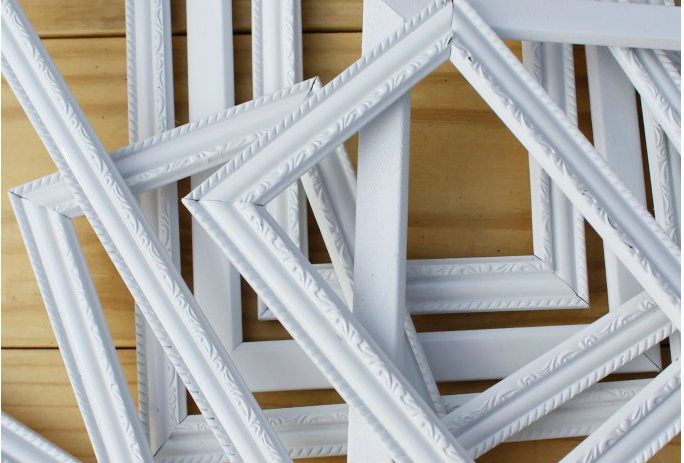 Frames at the thrift store are not cheaper than a dollar at the thrift stores near me . By the time you paint them to match there goes your time spent on painting them and the frames have to be the exact same size for project to work. Frames I got from Goodwill…about 30…cost me less than 5.00. That was in Bowling Green, Ky. I didn’t paint any of them cuz the wood grains are pretty. Of the 30, maybe 10 were the same size. My taste goes toward the eclectic so I don’t try to match anything….I’ll hang an oval frame with squares and rectangles. I love it.